Careers See what positions are available at Penguin Strategies! As the head of any company, you know that creating an advantage over your competitors is extremely important. No matter how secure you think your product is, there is always a chance that someone else will create a more lucrative, more affordable, or more appealing product and will siphon away your clients. This can also be said about up and coming companies that are attempting to gain a larger clientele base and convert one-time shoppers to steady returns. No matter which side you’re on, it’s important to stay ahead of everyone else to create leads. 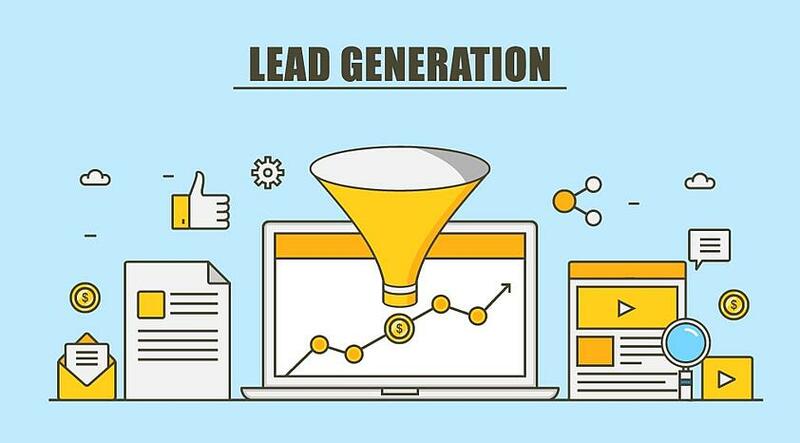 Lead Generation is one of the primary deciding factors in whether or not a product can get off the ground and succeed in a shifting market. It’s defined as the act of garnering interest or attention in a certain company or product. Leads—especially in targeted demographics—make marketing efforts more efficient and increase ROI. HubSpot has a reputation as the best as a general all-around B2B technology marketing agency. While many of the systems currently on the market focus on one or two aspects of sales and marketing, HubSpot provides a multitude of unique and beneficial tools to ensure information flow. Database usage is optimized to its greatest extent. Helpful features such as SEO templates and online calendars keep everything organized, running smoothly and growing. For B2B technology companies focusing on inbound marketing with a need for marketing automation, HubSpot is a solid solution for generating and solidifying leads. While pertinent industry information is generally discussed at HubSpot User Group (HUG) meetups, this article zeroes in on some of the key HubSpot features that are most helpful for B2B technology companies seeking to generate the best leads possible. This quick overview displays some of the most helpful HubSpot tools for generating leads and growing companies as well as what type of plan you’ll need to be able to access them. Each feature will be discussed in detail in a further section. For a B2B technology company, especially a startup, choosing where to spend your budget for inbound marketing purposes can be a difficult decision. This is especially the case when it comes to managing content. There are a lot of options out there. We’ll focus on comparing the top two: WordPress and HubSpot. WordPress sites are popular, but because WordPress was developed for blogging purposes, the pieces that can make a blog into a full-blown, effective website with marketing capabilities have to be added in separately. This takes time and often someone with a strong knowledge of PHP coding to be able to make everything work right together. It’s a bit unwieldy and can even cost companies money if they need to hire an IT director to manage all the pieces. HubSpot, on the other hand, was developed to be specifically geared toward helping companies grow, with marketers in mind from the get-go. The software was built to include all the pieces necessary for strong inbound marketing, including a solid content management system that is already streamlined, user-friendly and easy to manage. HubSpot cms software has built-in features for search optimization as well. Both WordPress and HubSpot are focused on content creation. Because content creation that attracts customers is the basis for inbound marketing, HubSpot’s CMS is an extremely important function of the software. For both platforms, we’ll take a look at three types of content: blogs, landing pages, and websites. Landing pages can be used to draw leads further into the content, providing deeper information on topics they’re excited about. The best use of landing pages is to answer questions that leads have or provide solutions to their pain points. Landing pages are good places for pillar content based on intriguing topics or any content that a form will link to (see the content strategy section for more information on content pillars). WordPress landing pages are built like the blog and require additional plugins and technical configuration to make them run smoothly. HubSpot has everything in one place with its integrated software, which means B2B technology companies can publish, test and optimize a page within one marketing platform. The more time you can save, the more you can focus on generating new leads. WordPress has themes, but some cost money, and sometimes several plugins are needed to get the landing pages the way you want them. HubSpot has a design center that allows you to use either templates or drag-and-drop features, so it is fast and easy to use. HubSpot website development is similar to its landing page development, with themes and drag-and-drop features. WordPress is also similar to its landing pages, with some themes costing money and the possible need for an IT support person who knows PHP to customize the theme or make sure it’s responsive and all the pieces work together properly. What they both have for website development: the only thing that WordPress and HubSpot have in common in regards to website development is that they both offer themes. What HubSpot has: drag-and-drop features for website creation, SEO optimizer, security, content delivery network (CDN) and hosting. 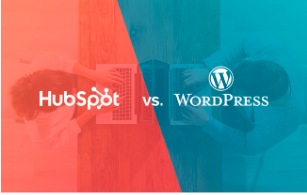 Here are a few other considerations about the content management systems of HubSpot vs. WordPress. WordPress doesn’t have much SEO built in. It relies on plugins like Yoast to help with SEO, but these plugins don’t always address new changes in SEO such as page speed, which might mean more and more plugins and a need for IT support to manage them all. HubSpot SEO is built in and is adaptable to trends in SEO. HubSpot software can also optimize content for SEO across the website (not just by pages), helps track competitors, monitors page performance for tracking things like page speed, tracking inbound links, and providing content organization for search. HubSpot Analytics allows you to make the most of your time by seeing which pieces of your sales funnel are working and which ones aren’t. You can view metrics like amount of content created, and the number of leads gained to conversion to customers. Many WordPress users rely on Google Analytics or purchase separate software to watch their company trends. Both allow sharing of content to social media sites; however, HubSpot also has the ability to monitor social media for key terms, phrases, and mentions. With HubSpot, you can also schedule and publish social messages and view social media analytics. When it comes to security, WordPress requires additional software for everything. HubSpot has an integrated firewall/VPN, intrusion detection system, web application firewall, distributed denial of service (DDoS) management, proactive scanning and network testing, and secure sockets layer (SSL) protection. The more time and money you have to spend finding plugins, updating software and making sure everything works right, the less time you’ll have to spend on lead generation. Ultimately, a fully-integrated program like HubSpot could give B2B technology companies the edge by allowing them to focus more on developing their content strategies and the content itself than on managing all the pieces. Inbound marketing is based on knowing what kind of content to create to bring in the most leads. As search engines have evolved, so has the need for different strategies to build the best content. HubSpot’s integrated SEO strategies continue to evolve along with the search engines themselves. HubSpot’s content strategy is all about SEO, but it’s based on topics rather than keywords. Search engine evolution, including Google’s featured snippets (to answer searcher’s questions right away) and RankBrain (to index and rank content), means B2B technology companies have to adjust the way they organize their material in order to be found by search engines, generate traffic and snag leads. Searchers are using mobile and voice queries more now, which means Google has had to adjust its search engines to respond to phrases instead of keywords. This has caused a shift in SEO away from simple keywords to long-tail variations that are topic-based phrases. Since marketers now have to look at visibility across topics rather than by keyword rankings now, associating your brand with core topics makes sense. Make sure to create a strong brand narrative that focuses on who you are as a company as well as what you have to sell. Then you can create pillar pages or broad overviews of a topic that links to all your blog posts and landing pages associated with that topic. Link those pages back to the pillar content. One high-performing cluster page ups the visibility of all the pages linked to it. This creates a strong content marketing ecosystem. Besides creating internal links and boosting visibility, this type of organization creates a better experience for web visitors who can more easily find what they’re looking for. That has the potential to generate future leads through word-of-mouth marketing from satisfied customers. Besides effective branding narratives and content pillars, using HubSpot to manage social media is one of the strongest content strategies. For example, HubSpot can manage Facebook, emails, and YouTube—all with their own particular advantages for startup companies—without you having to bounce back and forth between websites. Using HubSpot this way can generate leads from people engaged on those outlets. Keyword research does play a role in helping determine which topics to focus on mostly because it provides an idea of what potential customers are already searching for. Content strategies can be built around sought-out topics. The HubSpot content strategy tool can suggest topics based on relevance, competition, and popularity that might be of interest to you and your potential leads. Group your topic ideas together in clusters so that you can track them (HubSpot’s content strategy tool automatically does this for you). Create a tracking document that shows both the content you’ve already created as well as content you intend to create so that you can monitor your backlinks. There are built-in to-do lists for SEO so you can optimize while you write, and you can get advice as you go. As you build your content clusters, keep an eye on which topics are generating traffic and which ones aren’t. This will give you an idea of which topics to spend the most time on to increase ROI and generate more leads. With the content strategy tool, you can track the number of leads and customers that come from your organic traffic, so you can see the direct connection between the content you create and the leads you bring in. HubSpot Lead Flows is a powerful tool for grabbing leads as they come along. This feature allows businesses to create engaging lead capture forms in a variety of styles, including drop-down banners, slide in boxes in the lower left or right, and pop-ups. Each style is used most effectively for certain tasks. Slide boxes are good for promoting content and getting people to subscribe to your blog. Dropdown boxes are generally used to show timely offers or to grow the blog subscriber list, and pop-up boxes are used to promote social channels, grow email lists, and provide your most valuable content. Triggers are varied, as well. Time spent on a page, the percentage of the page that has been scrolled through, or the intent to exit can all trigger a lead flow. The Call-Out: this is the initial pop-up, slide box or drop-down banner with a button that leads can click. The Form—this appears when the callout has been clicked. Leads fill it out to enroll in something or get more information, and the data collected can be used for future marketing to this lead. The Thank-You: this appears when the form has been submitted. In the lead flow tools, you can add images to your lead flow, change the color and text. Custom fields can be added if you have a Basic Plan or higher. Lead flows can be placed on separate pages or on all pages, depending on what your needs are. You can also disable lead flows for small mobile screens. To use lead flows to generate new leads, use slide in boxes to put whitepaper and eBook downloads at the top of your sales funnel. This means you’ll be placing your content in front of potential customers when they’re interested and searching. You can also deliver timed pop-ups to re-engage visitors who are statistically about to leave your website. Dropdown or exit boxes are great ways to invite people to subscribe to your blog. Lead flows are particularly successful when they’re used for event registration, especially on pages that will be relevant to the event. Some results show a 50 percent conversion rate. Workflows are HubSpot’s automation system. They can be accessed from either the marketing hub or the sales hub on HubSpot and can be used for both marketing and sales purposes as well as for simplifying tasks in-house. In many cases, workflows are a series of emails based on the lead’s context, including what bits of your content they’re already interacting with and where they are in the sales funnel. Leads receiving workflows will already be reading your blogs, browsing your website and communicating with you on social media sites. The workflows are meant to nurture these leads a little at a time. These email campaigns allow companies to give attention to every contact at the desired levels, but they’re automated to save time. You get to choose which triggers to use so that the right email is sent out at the right time. The visual editor makes it easy to see (by way of a flowchart) how and when emails will be sent out. For example, if one lead answers yes to a question and another lead answers no, they will receive different email messages, and you’ll be able to see the flow on the visual editor. This branching logic for different lead responses means you can set mini-goals for certain leads and deliver messages to nudge them in that direction. Workflows can be tied to a specific goal, such as getting a lead to sign up for a consultation or sales presentation, so you can track progress and see whether your e-mail campaign is working. The goal-orientation allows businesses to tweak their workflows to make sure their e-mails are delivering the best value to leads and keeping them in the sales funnel. Contacts are removed from the workflow list when they’ve met the criteria for that goal. This is great for companies who want to track how many leads are converting to sales. Also, the contact list is updated as leads come into or drop out of the sales funnel. Start from scratch—this category is based on basic enrollment triggers, and the workflow can also be started for contacts or lists of contacts that are manually added to the workflow list. Center on a date—enrollment triggers are met, AND the enrollment centers on a date, such as a webinar, conference, holiday, etc. Center on a date property—this is similar to the ‘center on a date’ category, but the date is related to expirations, renewals, birthdays, etc. rather than to business events or holidays. Clicking on a workflow in your dashboard shows an actions box with how many contacts started and how many are active in each step. The contact performance section gives overall metrics, including conversion rates and the number of contacts that are lost or met the workflow goal. This information allows companies to tweak their email campaigns to ensure that leads stay in the sales funnel for as long as possible. In a roundabout way, workflows can also be used to generate leads. If, for example, a lead has just become a new customer, a shift in the workflow can direct the lead to other products or services that might also be helpful. 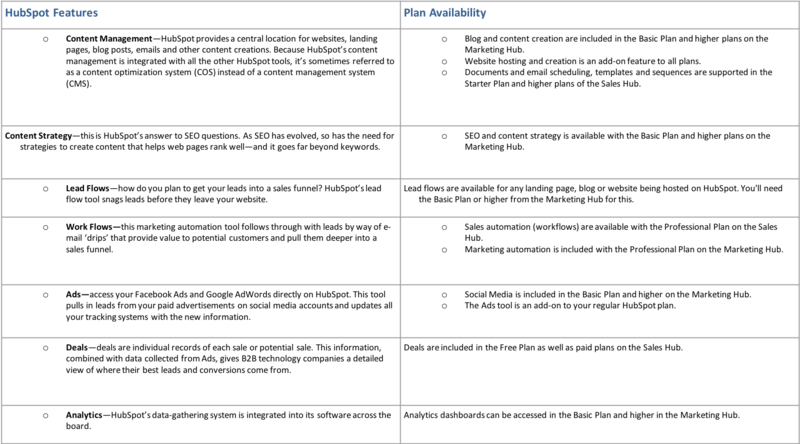 Some higher-tiered HubSpot plans use lead scoring criteria to trigger workflows. HubSpot can assign a score to each contact depending on their actions, and once a contact’s score is high enough a workflow can be triggered to help promote other actions. This is an automated way to unify the efforts of sales and marketing teams and raise the sales enablement factor for that particular lead. 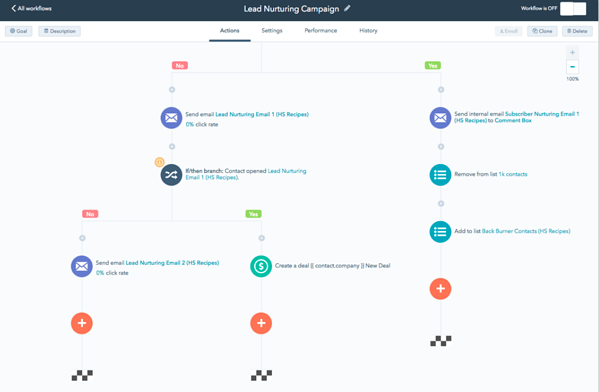 Beyond automated emails to leads in the sales funnel, workflows can be used to simplify day-to-day work and create more time for generating new leads. For example, when a lead takes action, internal notifications can be sent to both marketing and sales teams. Tasks can be added to sales teams or CRM so they can follow through with leads in the right position, and data can be managed in bulk. Managing paid advertisements on social media is streamlined on HubSpot. B2B technology companies can use HubSpot lists to create and manage these ads on Facebook, LinkedIn, and Google AdWords. HubSpot Ads integrates nicely with Facebook Ads, which is the top paid option for marketing in social media. New leads are imported into HubSpot from the social media sites, along with the ad data for good reporting. Businesses can create, schedule and monitor their ads inside their HubSpot portal. These paid ads allow companies to immediately provide possible solutions to internet searches, which can result in high-quality leads, and with the Ads feature, you can see exactly which ads brought in which leads. Clicks don’t always convert, but HubSpot Ads allows you to create ads and track them so you can fine-tune where you spend your advertising budget in order to generate the most or the best leads. Ads dovetail with HubSpot Deals, and reports using information from both sources can show how strong ROI is for paid ads. This helps decision makers determine how much money to spend on paid advertising and where to spend it for the best lead generation. The ability to track individual sales and compare them to each other can give B2B technology companies an edge when it comes to an understanding of how their leads filter through the sales funnel. Identifying what works at each stage of the process can allow companies to duplicate that for other leads. In HubSpot, a company creates a deal anytime there’s a potential for revenue—such as when someone asks for a business consultation that could lead to a sale. A deal is created around that new lead and tracked through conversion or loss. Deals can be associated with either contacts or companies. They begin with an event that has actually happened, like a request for more information, and are always based on customer actions. In fact, every stage of the deal pipeline is defined by actions that the lead makes. You can view those actions from the dashboard. The dashboard table view shows all your deals and can include information about the deal stage and closing date. You can customize the columns according to the information you want to track. You can also view deals with filters. HubSpot suggests filters that include deals closing this month, deals closing this quarter, and deals that were due last month but didn’t close. Part of a B2B technology company’s success lies in its ability to gather relevant data that it can use to refine its lead generation tools. Discussions at some HubSpot User Group meetups have focused on the importance of using the right metrics for your company, emphasizing that no company can make headway with information that doesn’t provide insight into the strengths and weaknesses of its marketing and sales strategies. Knowing which metrics to use and how to use that data to make good business decisions is vital for an action plan that generates high-quality leads and overall company growth. There are two parts to using HubSpot Analytics successfully: monitoring trends, and using those trends to push lead generation. Like all the other components of a great HubSpot plan, HubSpot Analytics is integrated across its features. Analytics allows companies to discover trends in their data over time and then use that data to understand customer behavior and react with targeted customer interactions. Reports can be created all marketing assets, including web pages, blog posts, landing pages, calls to action, social media accounts, and competitor comparisons. These reports can be broken down based on contact or company properties, which can give B2B tech companies a closer look at how certain types of customers filter through the sales funnel. Using Analytics, a company can track leads from the moment visitors appear on a website through a closed deal. Quality and quantity of traffic is recorded, as well as which traffic brings in the most leads and sales. Marketing executives can also look at specific criteria such as the number of page views, inbound links, and keyword rankings. On the dashboard, you can also see metrics like new visitors by source, average session length by source, and sessions by device type (mobile or desktop). Monitoring data only has value if the company uses that data to refine its marketing and sales efforts. Because HubSpot analytics are woven into every piece of a marketing and sales plan, getting relevant data for making strong decisions is quick. Decision makers can then focus on determining what direction to take based on the information. Two of the most pertinent questions are where to spend money on paid advertising and what kind of content to create to build organic traffic. For example, with a combination of information from Ads and Deals, marketers can see what paid ads are working to bring in leads and salespeople can see whether the leads being brought in are quality with a high chance of conversion. Being able to see this kind of ROI allows companies to refine where they’re spending money on paid ads and when and to tweak their campaigns to bring in the highest quality leads. Likewise, viewing information for a certain topic cluster can reveal whether or not it’s a good source of leads. Ultimately, it provides a B2B tech company with insights on which types of topics to pursue deeper and which ones to let slide. As you guide your B2B technology company through the coming years of growth, lead generation will always be a focus. Knowing the best ways to reach customers isn’t always easy. The marketplace is continually changing, and search engines keep evolving. Utilizing a B2B marketing automation platform like HubSpot that provides an integrated system will allow technology businesses to monitor trends, see a return on investment for their advertising dollars, and tweak their strategies to change with the times. Overall, this means businesses can continue to generate leads and grow. If you’re looking to maximize your lead generation possibilities with a HubSpot agency, Israel, Boston, and San Francisco all have branches of the B2B Technology marketing guru company Penguin Strategies. We work with B2B Technology companies to communicate their messages clearly and concisely. We help our customers reach their target audiences with the right information (blogs, whitepapers, social media, etc.) in order to convert them to actual customers and generate revenue. We specialize in IoT, Telecom, Security, Cloud, and Mobile technologies.